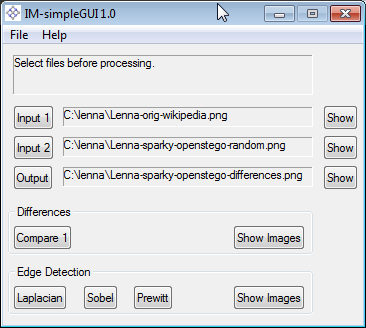 In addition ImageMagick contains image filters like Laplacian (IM, wikipedia), Sobel (IM, wikipedia) and Prewitt (IM, wikipedia). These filters are also used in steganography. Command line interface is practical for batch processing. 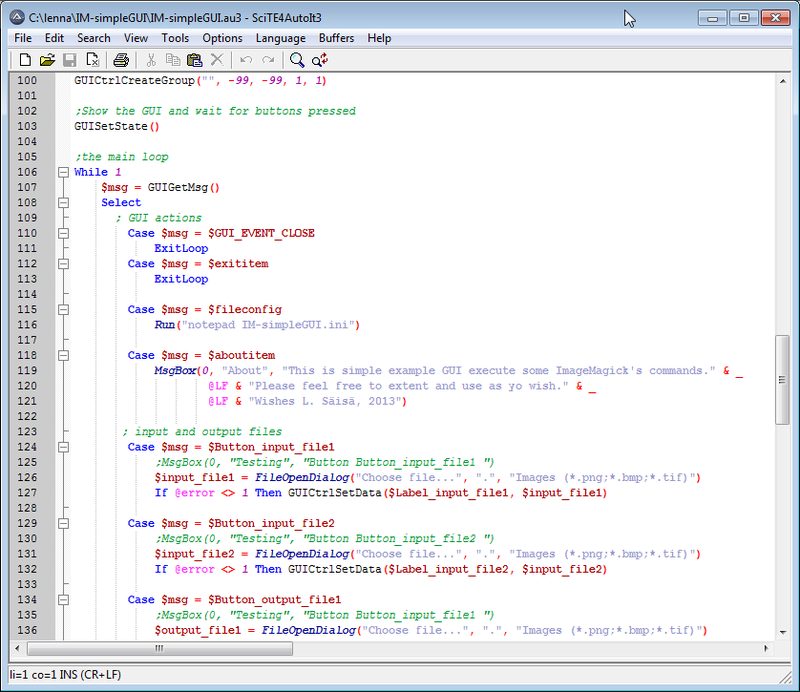 However, for casual interactive testing, a GUI alternative can be comfortable. 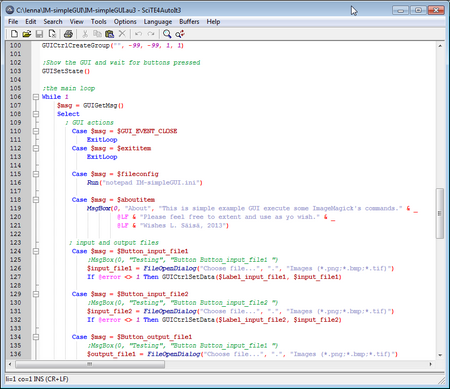 A simple GUI for ImageMagick can be done by AutoIt. The screenshot below shows the GUI made for this particular purpose. Original image is the Lenna 512*512 photo. The photo is widely used test image for processing algorithms. 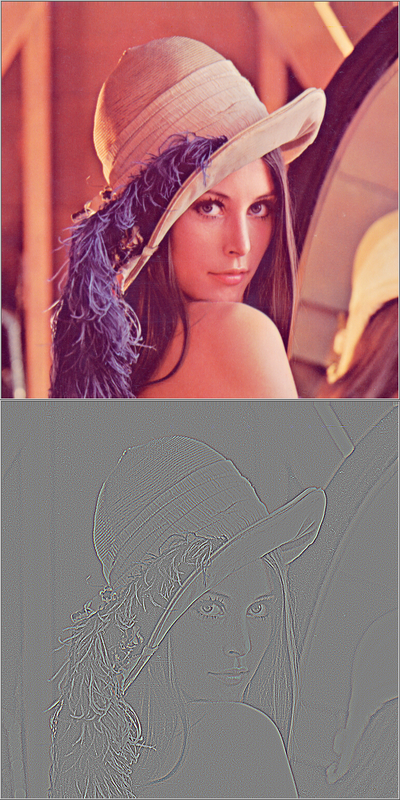 Case 1 Applying filter for edge detection. The images are: original and the applied Laplacian filter. File short.txt is encrypted and hidden in original image, starting from the top. The images are: original, modified and the differences. In the differences image, it is visible that only the top part if affected, and the rest of the image is unchanged. File “Lenna in Wikipedia.pdf” is encrypted and hidden in original image using the Sobel filter. The images are: original, modified and the differences. In the differences image, it is visible that the changed pixels (white) are concentrated at the edges. The tool is provided for learning purposes. It is kind of minimal example on how to develop a GUI for CLI tool. This entry was posted in Anvanced Tools, Audio and Video, DIY, Recommended Free Tools, Security Training, Awareness and Reports, Tests, Tips. Bookmark the permalink.